Cafenatics cafes are all over the place, and I feel like I’ve had my head in the sand as I have never noticed the cafe chain. This outlet is tucked away in the QV Melbourne shopping mall in the CBD. It’s quite stark but I find the booths kind of cool and private for a catch up session with friends. In the cake cabinet, the scones look great, but once delivered, my scone has been lightly toasted and severed in two – and not quite the scone it once was. There’s not enough of the jam as the scone is on the large size, and probably just as well because the jam is sickly sweet. The synthetic cream from an aerosol can is so soft and melts before my eyes into a milky pool of something. With low quality spreads like this on the market, its little wonder the scone eating has waned. Tea: A small selection of Tea Drop silk pyramid tea bags, served in a cup with a lid. A total rip off at the price. Overall: A very ordinary experience, although the booths are cool. My vanilla sencha T2 tea goes down a treat after my flight from Sydney. I am at the National Gallery of Victoria in Federation Square, and have a chuckle at the Mix Tape 1980s exhibition that reminds me of my youth. I am mesmerised by the footage of bands such as the Go Gos and INXS and their Countdown performances. On the same floor I find Crossbar Cafe, a bright corner to take a break from the art. When I visit they have a menu that reflects the 80s – I didn’t realise we had food relating to that era – so if you must, have your Quiche Lorraine and Tuna Bake. They serve scones singularly here, but you can add to the order if you like. My scone has the texture of a bread roll with a slightly unpleasant aftertaste. There is an ample amount of jam and cream for one scone, which is a bonus, and I’m happy with the double thick cream but the jam is a cheap variety. Tea: A good variety of T2 loose-leaf tea teabags served in a good-sized pot. Overall: A pleasant place to take a break from the art. When I first pass Hopetoun Tea Rooms my partner won’t let me go in nor gaze at the exquisite display of cakes in the window as he refuses to queue outside with all the women and children. Another attempt later in the day has us in and to a table by the window quickly and to his relief we notice several men amongst the clientele. The Devonshire Tea looks almost plain compared to the ostentatious surroundings, with two small scones and even smaller quantities of jam and cream. My first scone virtually crumbles when I tackle it, but the second holds itself together. The cream is nice and thick but there’s just not enough of it, and the jam is fairly ordinary. There’s something special about taking afternoon tea in these Tea Rooms as it feels like a parlour and we should be dressed in our finest. Definitely is a must visit. Tea: Great variety of loose leaf teas with some unusual choices. Overall: Ostentatious to the max! When I first walk through the front doors of the Intercontinental, my first thoughts are of how the hotel looks like the interior of the Old Melbourne Gaol with its floors of rooms looking out over the open atrium. I instantly love it! The Devonshire Teas are served in the Market Lane Bar on the ground level, which to me feels too much like a bar, and too little like the restaurant downstairs, which would be a better venue as it’s light and airy. The Devonshire Tea arrives to gasps of appreciation for its presentation – homemade pear, vanilla and ginger jam and Chantilly cream with light garnish. I’m not a fan of the jam as it’s too chunky and reminds me of marmalade (which I don’t like). The cream, infused with vanilla is lovely but could be a little thicker. The four bite size scones lack flavour or any resemblance to scones – the plain are barely passable and the raisin ones are terribly chewy. You won’t find the Devonshire Teas on the menu, only High Teas, but ask for the scones only, the staff are very obliging. Devonshire Teas are available between 2 pm and 5 pm daily. Tea: An unusual variety of loose-leaf teas. Overall: The Market Bar is more bar than afternoon tea vibe. I must admit, I am a bit short of time so I make a beeline for the Tea Room only glancing at an art installation being set up in the lobby. A bit naughty I know, but I was told I had to try the scones. The first thing I notice about the Tea Room, is exactly that, it feels like a tea room rather than just another gallery cafe. Mid week allows me to walk right on in and I have a choice of where I want to sit. Cocooned in a comfortable chair in the corner I feel warm and cosy. 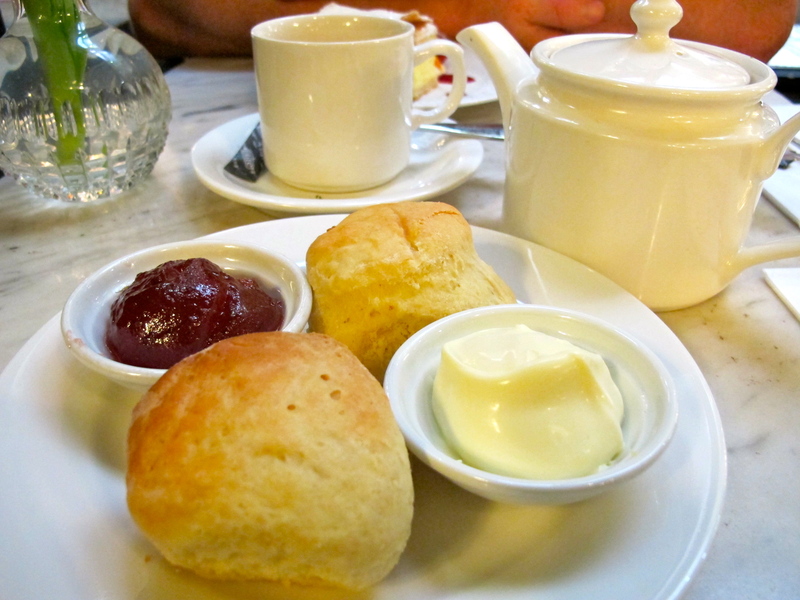 The Devonshire Tea is served with a black tea – a combination of Good Morning Tea and Melbourne Breakfast Tea – but since I am a non-black tea drinker I ask if I can choose from the menu. I am told that since it is quiet, it’s not a problem, so I opt for a white tea. The scones are good, but are a little salty and have a slight aftertaste. 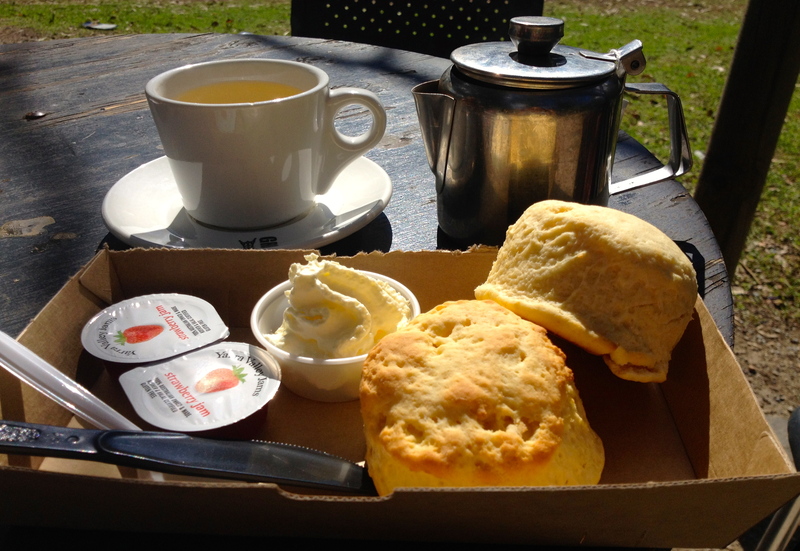 Considering the hefty price tag and the rave review a Melburnian friend gave me, I hate to say it but I am a bit disappointed (with the scones). The jam is pretty standard and the cream double thick. I ask for more jam and the waiter insists I take some extra cream as well – impeccable service. And next time, I’ll make sure I have enough time to wander through the gallery. Tea: An incredible variety of loose-leaf teas on the menu but included in the Devonshire Tea is a combination of Good Morning Tea and Melbourne Breakfast Tea. Overall: Finally a cafe that lives up to its name as a Tea Room. The swanky Emporium in Melbourne’s CBD is a delightful place to shop and hang out. Good news for chicks and guys that like chick things, like it’s sister property in Sydney’s Westfield, The Tea Salon is a place for catch ups and get togethers over scones and fine teas. The Tea Salon in Melbourne however is situated in a bonafide shop space with walls, a ceiling and onsite chefs. Maybe it’s the space that has instigated such scone creativity? The selection of scones takes the plain Jane scone to new heights. Alongside the original (plain), there’s white chocolate and cranberry, salted caramel and white chocolate, date and orange (gluten-free), milk chocolate chip, rose, and an out there banana and lime. I settle for the lavender, which is served at room temperature, just like most of the ones I have ever had in the UK. The scone has a hint of lavender with sprinkles of lavender on top, just to differentiate it. It isn’t dry, but I find it literally hard to swallow. The rich triple berry jam, or as The Tea Salon likes to call it, conserve, is lovely, and goes well with the thick cream. The servings of jam and cream aren’t generous, especially if you are heavy-handed like me, but there’s enough to go around, and I’m sure the staff would oblige if asked for an extra serve. The pretty teaware goes down a treat. It’s always better sipping tea from a quality teacup. Tea: A vast tea menu that will impress tea aficionados. Loose-leaf served teas are served in a good-sized pot and hot water top ups are available. A stroll through the Botanical Gardens in any city without having to dodge vehicles is a welcome respite and a great way to relax in the urban environment. The Royal Botanic Gardens in Melbourne is no different, and I relish being surrounded by lush foliage and duck and swan filled lakes. The Terrace Tea Rooms are perfectly placed by Ornamental Lake. The venue has a large seating capacity both indoors and out and I can only imagine that it’s a popular spot on weekends. It’s a serve yourself cafeteria style set up, with plates of scones, jam and cream set up like sentinels along the counter. I load my tea and scones on to a tray and take a table with the best lake view I can find. I am pleasantly surprised that the scones taste so good considering they are cold and sitting uncovered, but it is only lunchtime. 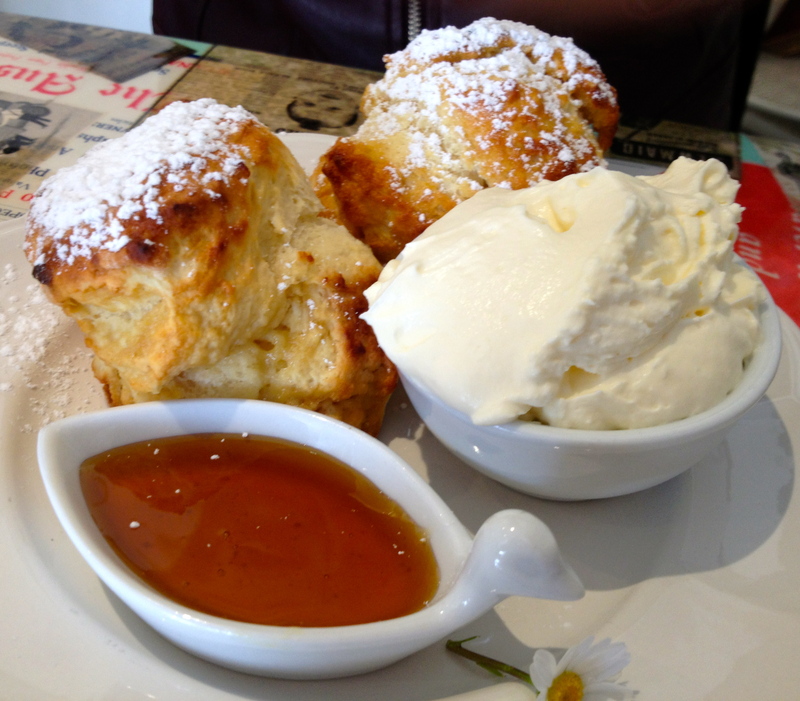 Soft and fluffy, the scones are well worth the stop, but slightly warmed up would be better. The cream is thickly whipped, with plenty of it and the jam to go around. I can understand why they need so much space! Tea: A small selection of Temple Tea Co loose-leaf tea in teabags. Overall: Surrounded by nature with a serene view of Ornamental Lake. It starts raining soon after we arrive at the Boathouse, but the staff have prepared the historic building well with the transparent awnings already down and the wood fire burning on the verandah. The possibility for crowds here is huge with indoors and verandah seating plus plenty of tables and chairs scattered outdoors by the riverside. As far back as 1908, locals were enjoying a boat shed refreshment room in this very spot, but over the years a larger building was built on higher grounds to protect from possible flooding of the Yarra River. After falling in disrepair, the current building reopened in 1985 after major restoration work and nowadays you can take a wooden boat out for a leisurely row or hire kayaks and canoes, and of course enjoy a Devonshire Tea surrounded by bushland only 10 minutes from the City. It’s a pay and order at the counter deal, and I am given my Devonshire Tea immediately, actually almost before I make payment. 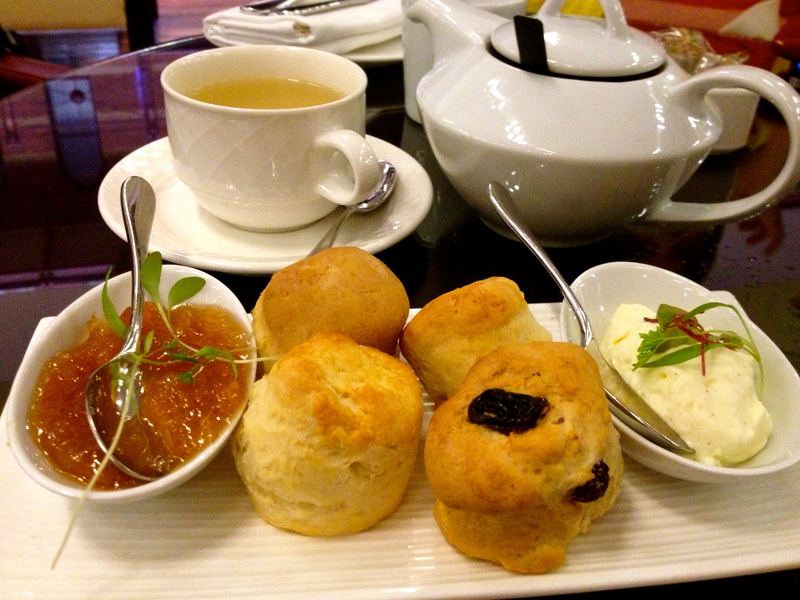 The scones are so fresh that they taste quite doughy with the middle of the scone a little raw. The strawberry jam, although plentiful, is very ordinary but the thick whipped cream is exceptional. The place is busy the Saturday I visit with everybody piling indoors due to the cold weather, therefore becoming very loud almost having to shout to be heard, so don’t expect a quiet chat over a cuppa. Tea: T2 teabags served in a small pot. Overall: A wonderful place for a scone on a sunny day. Only a 10-minute drive from Melbourne’s CBD, Studley Park Boathouse is a hidden gem. Surrounded by bushland, it’s the perfect city escape even if you only have an hour or so to spare. The pretty leafy parkland is a treat for picnickers, and for those who want to burn some calories can hire a rowboat, canoe or kayak and paddle along the Yarra River. Established in 1863, the boathouse offers a few dining options; restaurant, cafe and kiosk, which cater for every budget and/or occasion. For a Devonshire Tea, the kiosk is a safe bet as it’s open daily. It’s a pay and collect system, and the scones are served in a cardboard box with plastic utensils. This may not be appealing to some but the scones are sensational. Freshly baked, crispy on the outside and fluffy on the inside, it punches well above what I had expected. I find the cardboard box quite rustic, what I don’t find appealing is the portion controlled jams. The quality is better than the Allowrie brand, but still. The whipped cream is fresh but a tad light, and there isn’t much of it. If the scones weren’t so darn good, it could easily be a failure. Tea: A small selection of tea bags served in a small pot. Overall: A great place to be on a warm sunny day. You don’t come across many places with the same calibre as Jam and Cream. Sydney’s Tea Parlour in Redfern (unfortunately it closed down earlier this year) had something unique and impressed me just as much. When I tracked down this cafe via a google search and found it on a blog post, I earmarked it as a priority visit. 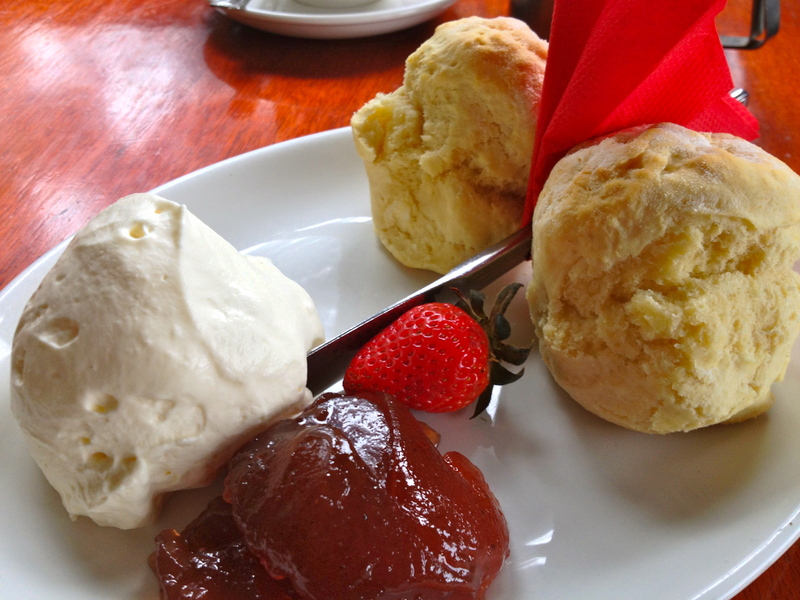 Opening in July this year, Jam and Cream is all homemade goodness with scones made to order. The 11 varieties of scones on the menu sound like a Country Womens Association (CWA) meeting with titles such as May, Peggy and Bertha. If you aren’t in the mood for the traditional plain scones, then skip Jane and try Beryl, she’s all about cherry and coconut, or how about Daisy, she’s golden syrup, and Winifred is dark chocolate chip. There’s a scone to suit every taste. One gripe though, the menu stated that all scones are served with jam and cream, but when Beryl arrived she came with chocolate ganache and Daisy, golden syrup. So ask if you have your heart set on the raspberry jam. It’s pretty good too – homemade although a tad runny. The cream is whipped thick, the only way to have it. Everything from the feminine laundry hanging in the window, to the sugar speckled with pink and the bright pink vintage caravan and chooks out the back, gives this place an authentic and warm, cosy ambience that’s hard to replicate. Before you leave and if you have any room left in your belly, you must try the vanilla slice and the profiteroles; actually everything here is fresh, homemade and too good not to eat! Tea: Pots of loose-leaf teas with a few choices of black and herbal varieties. Overall: Genuine old-fashioned fare, don’t miss it! 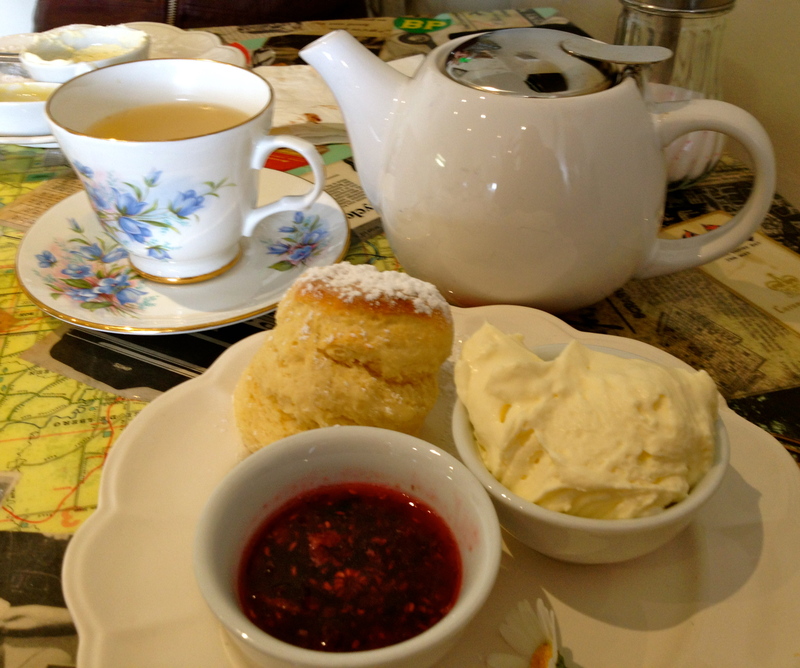 The Austen Tea Room, named after the famous British writer Jane Austen, occupies a corner in suburban Essendon. The seating out on the footpath is both inviting and popular in good weather – otherwise venture indoors. After my visit, I re-read The Austen Tea Room website, just to see whether I missed anything – and it seems that I have. Apparently there are specific rooms that are used for High Teas and are prettily decorated. I definitely don’t see any ‘rooms’, but perhaps it’s because upon entering, my friend and I make a beeline for the only comfortable chairs in the cafe, and by doing this, miss the passage to the stylish tea rooms. We are both surprised that it feels more cafe than tea room, with the only connection to Jane Austen that’s evident are the few pictures of Collin Firth and Jennifer Ehle from the 1995 Pride and Prejudice British television mini-series. There’s no dainty tea and dinnerware for a plate of scones, so I assume things like that are reserved for the ‘High Tea rooms’. I try one of each of the plain and fruit scones on offer this day. Both are fresh, even at 3.15pm. The jam is good enough, but is nothing more than average. The double thick cream is divine, making this a lovely spread, even though there is nothing ‘tea roomy’ about the experience. Tea: A few varieties of loose-leaf teas served in a small teapot. A hot water refill is definitely required. Overall: Not a fancy tea room like the website portrays. Apparently Poyntons Nursery was established 80 years ago. I can only imagine back then, the Maribyrnong Valley was a lot less built up as it is today. Nowadays houses sit cheek by jowl and the nursery feels compressed onto a corner block, although I am told this block covers 3.5 acres. The space is used well with plants and flowers of all descriptions and a range of homewares, gifts and furniture. Situated on the second floor above the homeware shops, Poyntons Outdoor Living and Poyntons Interiors, the Boulevard Cafe has a prime position. Floor to ceiling windows creates a bright and cheerful space, with the seats by the window especially viable for the lovely view over the Maribyrnong River. It’s close to closing time when we rock up, and the plain scones still taste fresh, and are not only visually appealing but are light and creamy. Those who prefer ‘stuff’ in their scones can opt for the date scones. The average jam is the only downfall here, and the double thick cream a real winner. Overall: A suburban nursery cafe with water views. Perched on Armadale’s High St, the elegant Mossgreen Tea Rooms, part of the Mossgreen Galleries and Auction House, is an inviting bright and spacious tea room. Popular for High Teas, it is possible to order a Devonshire Tea, although be warned, the scones are bite-size. Artworks adorn walls and starched white tablecloths give the space an air of sophistication. The display of cakes (I gather are used for the High Teas) is impressive, although each no bigger than a morsel of a finer cake or sweet. The scones are extremely small, and I am pre-warned before I put my order through. The maître-d suggests three scones or as many as I wish. Fresh out of the oven and crispy on the outside, there’s probably one or maybe two bites from each half. The jam is a rich berry and the cream double thick. These two items are so good that I fail to notice the scone at all; they are so small. The Wedgewood tea ware sits well with the decor and is a ‘must have’ if you are going to part take in a Devonshire Tea in this kind of environment. Tea: A fine selection of T2 loose-leaf teas served in silk bags in a teapot, and with a side cannister filled with hot water. Adjacent to the Abbotsford Convent complex, the Collingwood Children’s Farm is an inner city farm for inner city folk who can’t or don’t make it out of the city too often. It’s a chance for kids (big kids included) to wander the paddocks and connect with farm animals, cuddle guinea pigs and watch cows being milked. While the kids are occupied, head to The Farm Cafe, which is conveniently located on the grounds. The menu sounds delish and is loaded with health driven meals. The wholemeal scones are served at room temperature, and are robust rather than light and fluffy. I’m a real fan of wholemeal flour in baked items, but just not my scones, it’s just too heavy. The jam is the typical commercial jam served in most cafes. There’s barely enough for one scone, and thank goodness getting another dish of jam isn’t a problem. The double thick cream is a nice finish and brownie points for the lovely tea cup and saucer. Tea: Calma Sutra loose-leaf teas served in a Japanese iron teapot. Overall: Schmick alfreso dining overlooking the farm paddocks. Thanks to the National Trust, historic Como House in the suburban sprawl of South Yarra is still looking fine after 170 years. The property retains an air of mystery sitting majestically behind high fences and ancient trees. The gardens and lawns are well-kept, which no doubt is no mean feat, and visitors are welcome to spread out a picnic rug and while away an afternoon in the shadow of the former home of one of Melbourne’s aristocratic families, the Armytages. Out near the original stables, The Stables of Como looks to be a purpose-built cafe (but I could be wrong) that offers elegant interiors and a shady outdoor strip of benches and tables. There is no set ‘Devonshire Tea’ so order as many scones as you like. The batch of scones sits amongst a fine display of homemade cakes and slices, so you may be in for a hard choice. I empty the contents of the thimble-sized jar of Bonne Marilee strawberry preserve on to my fresh crisp scone. There’s plenty of rich thickly whipped cream, but I wonder if I order two scones whether I get anymore jam? Tours are available on weekends, but the garden and The Stables of Como Cafe are open daily. Tea: A standard variety of Larsen and Thompson loose-leaf teas served in a slightly grotty tea pot. Overall: You can’t go wrong with Historic Homes, pretty gardens and the cafes attached. The view from West Beach in St Kilda is a bit like the one from the shoreline of Botany Bay in Sydney; functional rather than pretty. The Port of Melbourne is touted as the busiest port for containerised and general cargo in Australia, so it’s hardly surprising that ships and containers dominate the view. Built in the 1920s to service the ever-growing bathing community, the Pavilion (apparently called Westie by the locals), still has traces of its former Art Deco beauty. Nowadays it serves as a function venue, tearoom and bar, but don’t expect a cosy British seaside tearoom. The venue is large and bright, and no doubt airy on hot days when all the windows and doors are open. 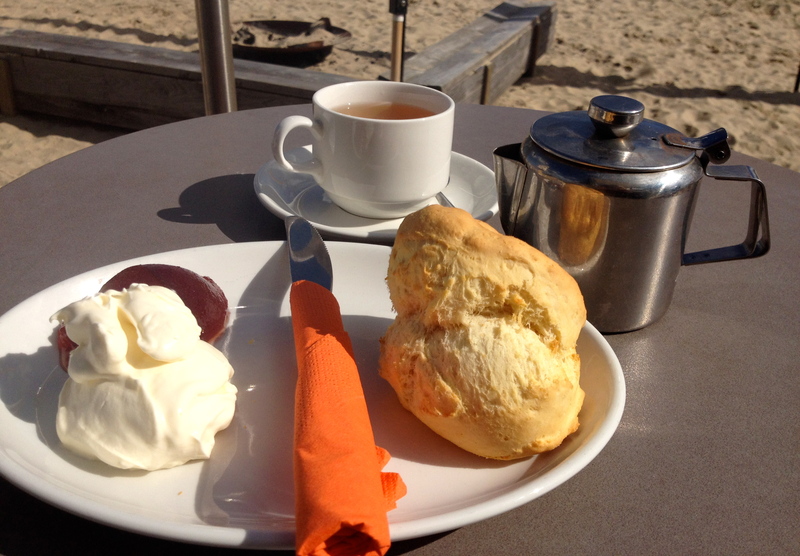 I take a seat out on the deck in the autumn sunshine, just inches away from the sand, and can honestly say that I have never had a Devonshire Tea by a beach. It feels odd; the two just don’t go hand in hand. Shouldn’t I be eating something a tad beachier like a Chico Roll? I order one scone and it’s definitely made fresh this morning – crispy and fluffy in all the right places. It’s a good size, so I’m glad it’s served with lashings of jam and cream. The jam is average and reminds me of the IXL strawberry jam we used to eat as kids that came in a can; jelly like rather than syrupy. The cream is double thick, but not as heavy as your usual double thick cream – I like it. Tea: A variety of teas that I assume are tea bags, as my teapot arrives without neither tea bag nor tea leaves in it. Overall: A touch of art deco by the seaside. Find Adriano Zumbo’s patisserie in South Yarra’s backstreets and you’ve found the flamboyant and utterly cool Zumbo Cafe. Dedicated to serving High Teas and cocktails with a twist, and rocking a dessert bar on Saturday nights with a DJ and fancy cocktails, Zumbo has the sweet things covered. Those with savoury tastebuds shouldn’t despair; the breakfast menu is extensive so you can bypass the pancakes and crumpets. The ‘Sconti’ is Zumbo’s take on the Devonshire Tea. It’s rather unusual and will please both palates. Start by taking one of the fluffy and melt-in-your-mouth scones and slaver it with squacorone cream cheese and top it off with capsicum jam. It’s not for someone like me who has a sweet tooth, but I’m sure the combination works well. The scones are almost cake like, but I like them. They taste even better with the mixed berry jam and rich thick cream. The ‘Sconti’ is available on Friday, Saturday and Sundays only. Tea: A great selection of loose-leaf teas by Harney & Sons served in a large pot. Overall: Cavernous and cool digs. 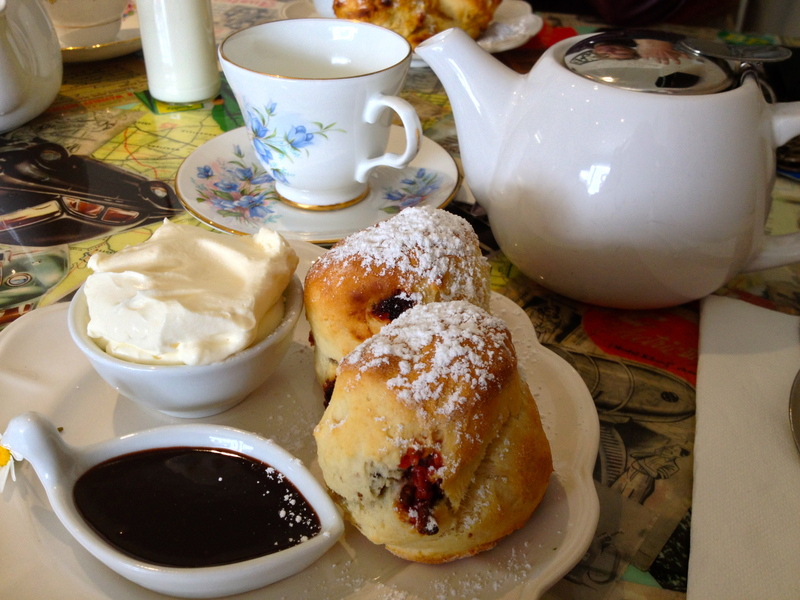 You need to try “The Austen Tea Rooms” in Essendon, Victoria – the scones are to die for! It’s Jam and Cream in Heidleberg Heights. 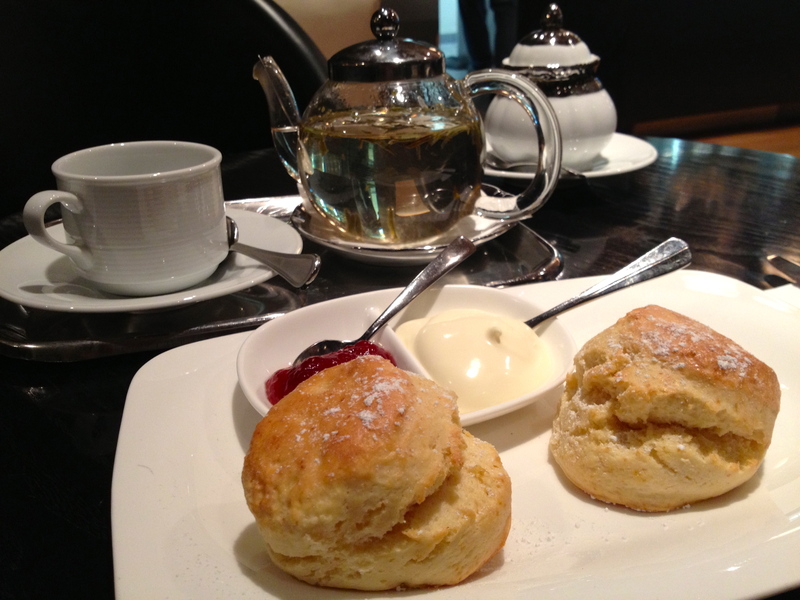 Any mention of gluten free scones would be good as they are so hard to find in Victoria. I’m going go do a ‘Gluten Free’ scone page, but it’s slim pickings at the moment I’m afraid. I’ll keep my eyes peeled, though. 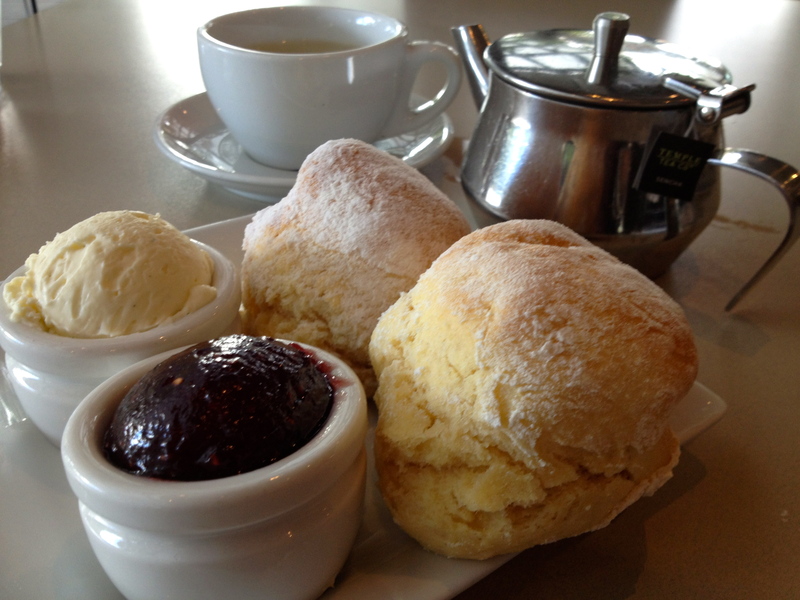 The Tea Rose in Fairfield do an amazing GF scone to order. 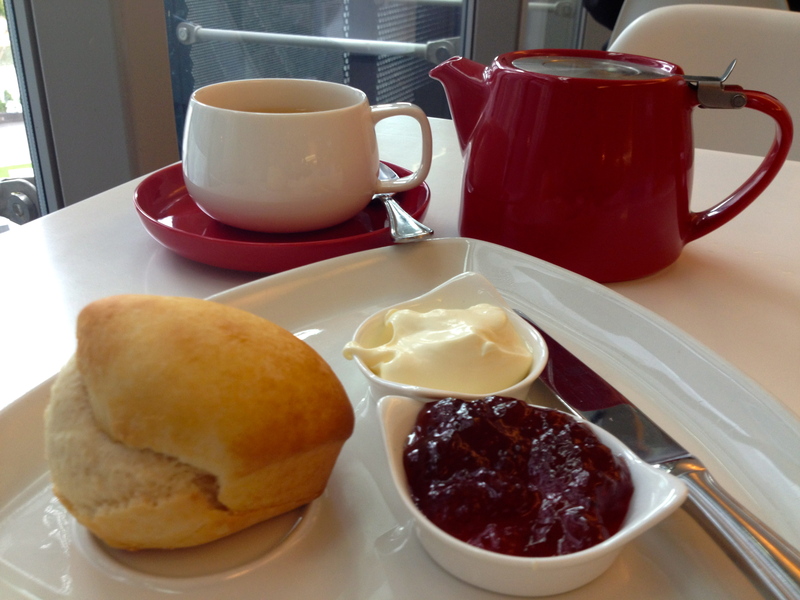 Hi Toni, I chanced upon The Tea Room on level one of the National Gallery of Victoria yesterday. The scones were crisp and golden on the outside, light and buttery on the inside. The jam was good and the cream thick and gooey. The service was congenial as were the surroundings. Washed down with a cafe latte, it was a five tea pot rated experience. Thanks for letting me know that you visited The Tea Room – it is a lovely place. Glad to hear that the quality hasn’t slipped. With all respect o Zumbo which I like, those Zumbo ‘scones’ look no more like scones than the rubbish slabs of dough they call scones at Miss Marples. Both are not scones.